Road to Freedom was an important reflection of American anarchist thought and activity in a most trying period when repression on the one hand, and the appeal of a new Soviet government on the other, cut deeply into the anarchists' efforts at growth or even maintenance of a small tendency. Rather than the organ of a social movement, the paper was the product of a handful of men and women who subordinated their often considerable differences to the desire to keep alive one English-language anarchist paper in the United States. And although its voice was heard by few outside anarchist circles, the Road did successfully preserve a little longer the hopes and dreams which found, in various ways, new life through younger generations of thinkers and political activists in the 1940s and again in the 1960s. 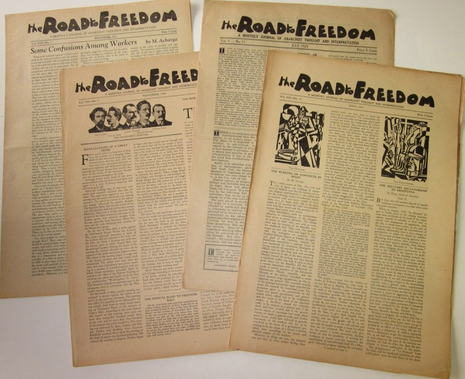 Road to Freedom was an exotic product even within the anarchist community, for its origins lay in experimental education, Utopian anarchism, and even working-class anarchist "propaganda of the deed." Its immediate parent was the Stelton, New Jersey, settlement, which was founded shortly after World War I by the Francisco Ferrer Association (named for the martyred Spanish educator) and grew famous for its "Modern School' of pupil-oriented study, noted widely in Progressive educational circles. The Ferrer Association's first leaders were sons of activists in an Italian anarchist "New Era" movement in Paterson, New Jersey, at the turn of the century, organized by Gaetano Bresci who returned to Italy in 1900 to successfully assassinate King Humbert.1 By the time of the Road's founding, the Stelton group served primarily as the publication body for a native American movement which had fallen upon bad times. The anarchist movement in the United States had never been large by European standards. Despite the anarchists' affinity for the Industrial Workers of the World, no such relationship developed as on the Continent where the industrial syndicalists regarded themselves as the "practical wing" of the anarchist movement. There were brilliant figures like later Communist party leader William Z. Foster, who were attracted to French syndicalism and thus to anarchism, but most Wobblies were suspicious of all brands of intellectualism as "impractical," or were simply "Industrial Socialists" like William D. Haywood. Emma Goldman carried on her lively review. Mother Earth, defending strikers, freer sexual patterns and artistic experimentalism alike, but aside from plaguing Socialist party locals around election time, had little influence on mass politics. Her companion, Alexander Berkman, spent fourteen years in prison after his 1893 attempt to assassinate Henry Clay Frick, and emerged agitator-at-large and editor of Blast, but was not politically potent in a lasting way. For some anarchists, a greater tragedy was the close of a nineteenth-century tradition of Individualist intellectualism with the retirement of its last great figure, Benjamin Tucker. By 1920, intellectually as well as organizationally, the bulk of American anarchism existed within immigrant groups, principally Italian, Russian-Jewish and Spanish, which, because of their language barrier, had little contact with the nation beyond. The repression of the "Red Scare" fell very hard upon a movement with no machinery for effective defense. Moreover, the Russian Revolution seemed for a time to prove the anarchists wholly impractical dreamers—especially since the first reports from Russia convinced Socialists and syndicalists alike that the Russian workers ruled directly through Soviets, in a manner similar to the IWW's vision for America. The gradual disillusionment with Lenin's belief in immediate world revolution did the anarchists scant good, for the complacency of the 1920s encouraged no dissident form of politics. Thus the opening editorial in Road to Freedom was permeated with pessimism. The man who "utters a word of warning to the persecuted," it held, was forced to "lie low" unless he had the defense of a party structure. And the spectre of a "man on horseback" in America seemed to offer even dimmer prospects for human emancipation. Since the masses were "fed lies" from all the sources around them, they were (as the paper later noted) "densely ignorant, mentally lazy, and unbelievably cruel. 2And the more power the State possessed, the more laws it would pass, the more "criminals" it would produce, and the more excuses it would have for extending its size and power. The Socialists seemed less culpable for their reformism and parliamentarism— they were politically impotent by the mid-1920s—than for their lack of criticism for the regime in the USSR. There, anarchist peasant leaders like Nestor Mahko had led forces against the White and Red Armies and were at last driven into exile; there, the Kronstadt Rebellion of anarchist tendencies was crushed by military forces under the direction of Leon Trotsky (whose criticisms of Stalin later drew little sympathy from the Road). All anarchists in general, but especially the Russian-American anarchist groups, were made profoundly aware of the political prosecution, all the harder to bear when it was delivered in the name of communism. The case of Peter Petrella, which the Road recorded in 1930, was exceptional in America but repeated in substance frequently across Europe. Petrella's father and brother had been executed by Fascists in Italy, his remaining brother died a political prisoner in a Latin America jail, and he was himself killed in Detroit by the police following an incident at a Sacco-Vanzetti memorial meeting where he defended himself against Communist attacks by shooting two Communists. The differential treatment given political prisoners of various persuasions by the Communist-dominated International Labor Defense in the United States was only one burning reminder of the many anarchists languishing in Russian prison cells. This awareness of intellectual impoverishment manifested itself in constant dissatisfaction among anarchists as to the role and content of the paper. Its editor for five of its eight years of existence was Hippolyte Havel, who, even by the mid-twenties, was a three-decade veteran of anarchism in Europe and America, and who, after too many years of internecine strife, sought a neutral policy between the two principal currents of anarchist-communism (rather weak in the English-speaking sector) and individualism. During the easier years surrounding World War I, Havel had been active in the orbit of the Socialist magazine Masses and shared its Greenwich Village bohemian environment. This perhaps accounted for his amiability. But. even he found it hard to keep patience with both the tendency for readers to demand an easily readable propaganda sheet and the contradictory desire by many for continual philosophical discussion. Havel did stress the need for financial support of Road to Freedom by anarchist groups outside Stelton that seemed to add little constructive effort to their criticism of the pappr. By 1930 he reported that the paper, which was in constant financial difficulty, suffered most of all from apathy. Some writers blamed the lackadaisical attitude of the foreign-language groups toward the creation of an American movement; a correspondent's reply, reflecting the difficulties of anarchist agitation in the United States, was that the Anglo-Saxon character was inadequate for the pursuit of an "invisible ideal," dooming the British and American movements to failure.9 Spanish-language editor Pedro Estreve answered analogously that English-speaking workers could earn triple the wages of their less fortunate comrades and were thus "bourgeois" and closed to anarchist propaganda.10 Whatever the reason, the Road, like the native strain it reflected, remained a collection of sometimes brilliant, often eccentric single figures rather than a united force for change. Even the stars in the anarchists' galaxy of supporters were fading with age. T. H. Bell, a Scottish-born anarchist who had broken through London police lines to insult Czar Nicholas face-to-face, and had later chained himself to a lamppost in Paris to speak until his voice gave out, had in the latter part of the nineteenth century known "intimately" Kropotkin, Socialist heroes Edward Carpenter and William Morris, Oscar Wilde and other leading radical personalities. Now in his seventies, and living in Los Angeles, Bell continued to argue garrulously for a nonviolent transition to anarchism, and to debate with the ghosts, like that of Kropotkin, who continually appeared (through their republished writings) to oppose his plans. Less glamorous but perhaps more important was the veteran anarchist Jo Labadie, who revealed in Road his intent to found the Labadie Collection at the University of Michigan, now a repository for important radical documents. But these figures and others were not replaced or succeeded by young anarchists during the life of Road to Freedom. Indeed, the only active anarchist youth group published Vanguard, a working-class oriented, anarchist-cominunist publication very far from the philosophical idealism dominant in the Road. Closer and more typical of the Road at its best was the paper's "Education Page" by Alexis Ferm who was heavily involved in the activities of the Modern School. Here, Ferm argued for the individual personality development of the child, as against even anarchist propaganda in the school. Anarchists, he candidly added, had no better ideas on child-raising than did anyone else, while the curious Progressive schoolkeepers seemed little concerned in their experimentalism with the effect on the child's individual development—indeed, conservative teachers, inadvertently, were often far better for their pupils. Thus the Modern School was a sign of great humanity, even of success, within the larger isolation and political failure of anarchism: it was the one concrete substantiation of the common anarchist belief in the reality of a new life-style before the end of capitalism. 1. Corinne Jacker, The Black Flag of Anarchy: Anti-Statism in the United States (New York: Scribners, 1968), pp. 138-139. 2. [Walter Starret], editor's note to Henry Arrigoni, "Are the Individualists Detrimental to the Movement?" Road to Freedom, July, 1930. 3. W. S. Van Valkenburgh, "On to Washington!" ibid., November, 1928. 4. Harry Kelly, "Red Letter Day," ibid., August, 1929. 5. [Walter Starret], "May Day in 1930," ibid., May, 1930. 6. Letter from Benjamin Tucker, ibid., June-July, 1928. 7. "A Present Day Anarchist," ibid., February 1926. 8. [W. S. Van Valkenburgh], editor's note to Emma Goldman, "An Unexpected Dash Through Spain," ibid.. May, 1929. 9. W. S. Van Valkenburgh, "What Is Wrong With Our Movement?' ibid.. May, 1928. 10. "The Anarchist Conference," ibid., September, 1925. 11. "Sacco and Vanzetti," ibid., August, 1929.